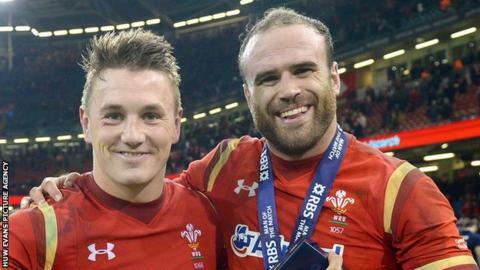 Jonathan Davies is fit for Friday's Six Nations game with France as Wales recall wing Alex Cuthbert and forwards Dan Lydiate and Bradley Davies. Davies has recovered from a hip injury sustained in Wales' win over Scotland while Cuthbert replaces Tom James. Lydiate returns at blindside flanker with Justin Tipuric dropped and Sam Warburton moving to No.7, while Davies is in for injured lock Luke Charteris. Bath fly-half Rhys Priestland has been passed fit and is on the bench. Only one of coach Warren Gatland's three changes is enforced, a knee injury ruling out Racing second-row Charteris. The familiar back row of Lydiate, Warburton and Taulupe Faletau is restored at Tipuric's expense while Blues wing James is dropped from the 23-man matchday squad. James' replacement Cuthbert has scored 15 tries in 40 caps for Wales but the 2013 Lions winger has not crossed in the Six Nations since February 2014. Wales, seeking to beat France for a fifth time in a row for the first time since 1927, brought their team announcement forward from Wednesday to Tuesday after the injury situation became clear quicker than expected. "We initially thought we would have to wait until later in the week to have a final update on injuries," said Gatland. "But we know where we are earlier than expected and have told the squad, hence announcing today as well. "It's set to be another huge Six Nations weekend. France come to Cardiff unbeaten in the campaign so far and impressing under Guy (Noves). "We are looking to continue our unbeaten run and will be looking for another step up after the victory over Scotland." France and England lead the 2016 Six Nations with two wins from two while victory for unbeaten Wales on Friday will move them top - at least until England play Ireland at Twickenham on Saturday - as Gatland bids for a fourth Championship since his first campaign in 2008. Wales team to face France: Liam Williams (Scarlets), Alex Cuthbert (Cardiff Blues), Jonathan Davies (ASM Clermont), Jamie Roberts (Harlequins), George North (Northampton ), Dan Biggar (Ospreys), Gareth Davies (Scarlets); Rob Evans (Scarlets), Scott Baldwin (Ospreys), Samson Lee (Scarlets); Bradley Davies (Wasps), Alun Wyn Jones (Ospreys); Dan Lydiate (Ospreys), Sam Warburton (Cardiff Blues, CAPT), Taulupe Faletau (Newport Gwent Dragons). Replacements: Ken Owens (Scarlets), Gethin Jenkins (Cardiff Blues), Tomas Francis (Exeter Chiefs), Jake Ball (Scarlets), Justin Tipuric (Ospreys), Lloyd Williams (Cardiff Blues), Rhys Priestland (Bath), Gareth Anscombe (Cardiff Blues).